The Christmas season is a special time of the year. It’s a time when friends and family gather in the spirit of love and community. Water Valley recognizes the special gift the Christmas holiday provides to us all and wants to provide everyone with a celebration venue. The six-week Christmas celebration will take place every Saturday from Nov. 21 to Dec. 19, as well as Sunday, Dec. 6, on the Pelican Lakes driving range. The venue is located at 1600 Pelican Lakes Point in Windsor. From 12-4 p.m. the driving range will be transformed into a Christmas extravaganza with Santa Claus, sleigh rides, live nativity scene, carolers, ice skating rink and much more. 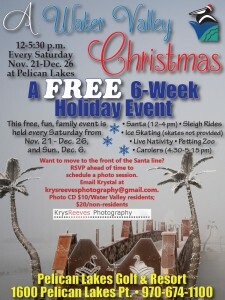 Santa Claus will visit from the North Pole and eager to take pictures with your family. If you want to move to the front of the Santa line, schedule a photo session by emailing Krystal Reeves at krysreevesphotography@gmail.com. The cost for a photo CD is $10 for Water Valley residents and $20 for non-residents. For more information call Pelican Lakes Restaurant & Bar at 970-674-1100. Merry Christmas, and happy holidays from all of us at Water Valley!